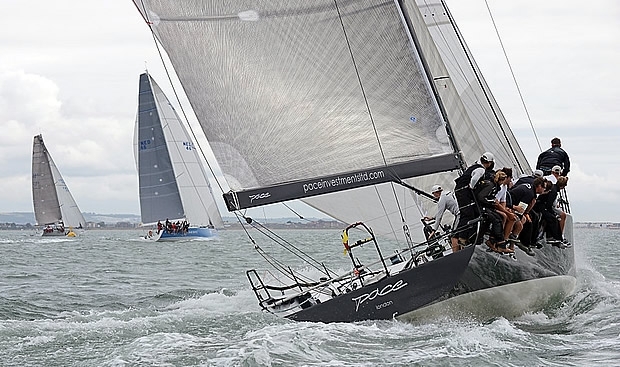 The defining feature of the third day of the regatta was a gusty and shifty southerly wind that varied from less than 10 knots at times to gusts of more than 20. After a bright morning, a band of cloud with showers on its leading edge was moving eastwards towards Cowes, with very light winds forecast to follow in its wake. As a result, relatively short courses were set to make good use of the day’s best winds. The Quarter Ton fleet started on a spinnaker reach, heading east from the Black Group line off the Royal Yacht Squadron. Yesterday's winner, Louise Morton's Espada, together with Eric Reynolds’ Magnum Evolution, were a couple of lengths ahead of the rest of the fleet at the gun. Lincoln Redding, Led Pritchard and Cat Southworth’s Whiskers was next, just ahead of Dutch boat Theo Bakker’s Freres-Sur-Mer. In the Sigma 33 class Allan Fraser’s Prospero of Hamble and Mark Watkins’ Spirit of Kudo led away from the start. Spirit of Kudo hoisted her spinnaker at the gun, losing a couple of lengths in doing so. Two minutes later Prospero also hoisted and soon every boat was flying a spinnaker. Prospero then pulled out a 10-length lead, with Stuart Brand and Emma Gage’s Ephesian, the winner on the first two days, a further 10 lengths behind in third. Ephesian eventually overhauled both Prospero and Spirit of Kudo, but was denied a third win by Jeff Worboys’ Workout, which finished with a lead of almost three minutes. Prospero was third, finishing 81 seconds behind Ephesian. One of the more crowded starts on the RYS Black Group line today was for the 31 yachts in IRC Class 6. Starting towards the northern end, Ed Browne and Nick Daniels’ First 32 Gravity Boots initially led the fleet away. A few lengths behind her was Simon Cory’s Cory Yachts 290 Icom Cool Blue – she already had the spinnaker up on the tight reach, but at this stage it was only filling intermittently. Next was Ian Braham’s MG346 Enigma, again with her spinnaker hoisted, but unable to get it filled in the disturbed air around the fleet. Having extended her lead on the boats struggling with spinnakers, two minutes in Gravity Boots hoisted her kite, but it filled in a gust and she rounded up in a spectacular broach that allowed Icom Cool Blue to get past. At the same time another boat, Mark Brown and Justin Leese’s Figaro Black Diamond, was quietly pulling through to leeward of the fleet. For a couple of minutes she and Icom Cool Blue were neck and neck, but then Black Diamond pulled ahead and continued to extend into a useful lead on the water. She was ahead at the finish, taking line honours more than a minute and a half ahead of Enigma. However, on handicap Black Diamond was unable to save her time on either Enigma or on one of the lower-rated yachts in the fleet and the oldest yacht at the regatta, Sir Michael Briggs’ Clyde 30 linear rater, Mikado, which dates from 1904. White group competitors had another day of intense competition, with two classes standing out among the many close races. In the Flying 15 fleet Paralympic sailor Andrew Millband and Tony Hastings’ Fifty Fifty was the only boat to record two podium scores in the first two days of racing and today proved just as tight, with the first four boats just 63 seconds apart at the end of their two-hour race. Mike Boll and Gil McCutcheon’s Ffuraha notched up their first win, finishing with a 47 second cushion ahead of Alex and Mike Tatlow’s Affore the Weak. Five seconds later Fifty Fifty was next across the line to take third place, with Nick Clarke’s Black finishing 11 seconds later to take fourth place. In the Squib class start, Jim Holdstock and Ray Prime’s Jess looked clear ahead of the fleet on port at the outer end of the line, although Martin and Anne Harrison’s Hussar was also very well placed, as were Peter Wilson’s Crazy Diamond, and Duncan Grindley and Dave Ross in Surprise. A few boats tried spinnakers on the tight reach across the Solent to Lepe Spit, but quickly realised it was not a speed-enhancing decision. As soon as the boats behind saw this, the entire fleet headed for deeper water, simultaneously changing direction like a flock of birds. On the next leg, a windward one to East Knoll buoy, Hussar initially stayed slightly to the right hand side of the course and lost a couple of places to boats on the left. On the last windward leg to Seafarer Ale, Hussar stayed to the right, waiting for a big wind shift before tacking onto starboard. The strategy worked and she rounded the final mark, Seafarer Ale, with a 50m lead. Today was also a close race for many others in the class – six boats rounded the second mark simultaneously, and three boats – Jess, Chris Gear and Andy Faulks’ Osprey, and Kevin and Marney Gibson’s Satu – rounded the last mark together and were only 32 seconds apart at the finish. Places eight to twelve were then decided by just 51 seconds.